Chile produces many fine wines at different price points. Some people though view less expensive wines as simple and not too enjoyable. But that is not always true. In part, a wine may taste simple because it did not have a chance to decant and become more expressive. And many people buying wines around $15 may want to open the wine, pour it and start drinking. But if you are willing to give these budget-friendly wines a chance to surprise you, give them some air. My case in point are these two Reserva level wines from the Vina Santa Carolina winery, Leyda Valley in Chile. This is a cooler climate region nearer to the coast. It should be perfect for aromatic white grapes, like Sauvignon Blanc, and the Pinot family of grapes. The third wine is a Cabernet Sauvignon coming from the warmer Colchagua Valley. Reserva level wines are typically from riper grapes, may be hand harvested, come from a single vineyard, and have longer French oak barrel ageing, compared to entry-level wines. So you should expect more from a Reserva wine. I tasted the three wines twice. The first time is chilled to the appropriate temperature, then opened and immediately tasted. I then left the bottles for a day in a refrigerator and bring the wines up to tasting temperature when I am ready for my second evaluation. The results of tasting the wines before and after decanting (exposure to air) are quite remarkable. The undecanted wines to me were OK, but were not that aromatic or flavourful and received a lower mark than the wines after decanting, which showed a greater variety of aromas and flavours, and these aromas and flavours were more pronounced. You don’t need to leave your opened bottle out for a day. Pour it in a decanter if you have one and let it stand for 1-2 hours. You may need to chill the wine for 30 minutes before you pour it to bring it to a better serving temperature. 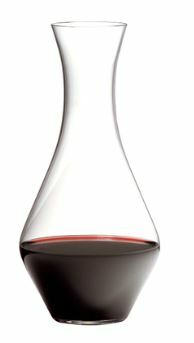 If you don’t have a decanter, you could pour the wine into an empty wine bottle, then back again into the original bottle (making sure the empty bottle is washed clean with water). Again give the wine about 30 minutes to chill before serving. And if neither of these options is available, pour it in your glass and swirl it about for a few minutes. Take a sip, then swirl again. Get the air into the wine and see how it changes. 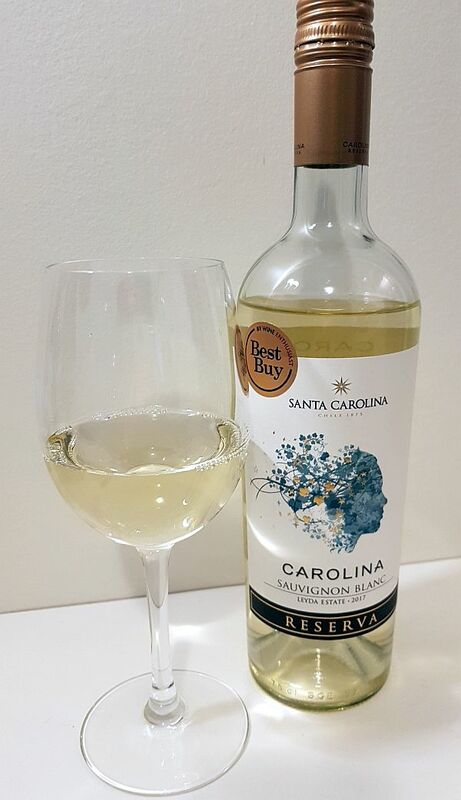 Santa Carolina Sauvignon Blanc Reserva 2017, Chile ($13.99) – With Decanting – Medium bright lemon in colour. Medium plus intensity nose with lees, lemon, grapefruit, light pineapple, and also pronounced jalapeno pepper, asparagus and other green fruit aromas. The wine is slightly off-dry, medium plus body, with medium acidity (resulting in a smoother mouthfeel) and flavour intensity. Prominent jalapeno pepper and asparagus flavours, along with lemon and citrus rind, with light stone fruit, in particular, peach flavour from mid-palate to finish, as the acidity level lessens. Also more evident minerality to this wine throughout the sip. Medium length with citrus, lime, some pepperiness, bitterness and minerality on the finish. 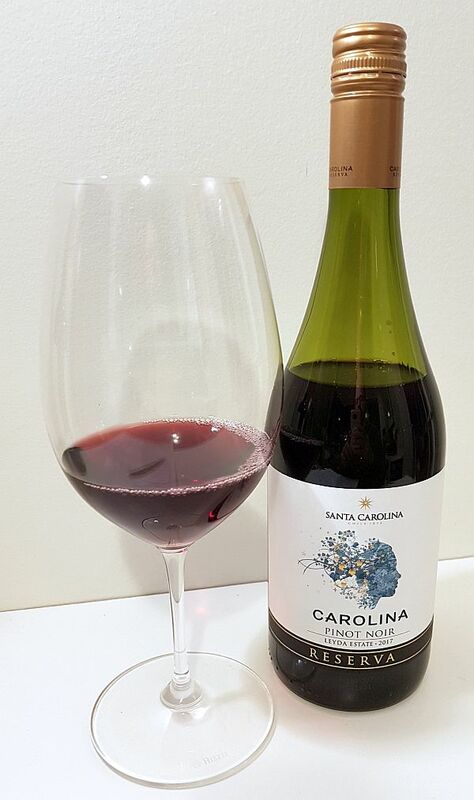 Santa Carolina Pinot Noir Reserva 2017, Chile ($13.99) – With Decanting – Lighter garnet colour, translucent to the core. Medium intensity aromas of smoke/flint/meatiness, red fruits, raspberry and more bramble. The wine is smooth and dry, lighter acidity and tannins, medium body with more roundness, and medium flavour intensity. It is quite floral, with violets, along with red fruit flavours, and a very light pepperiness. The wine finishes dry, with light red fruit, and a hint of floral and some bitterness. Very light tannins on the finish. 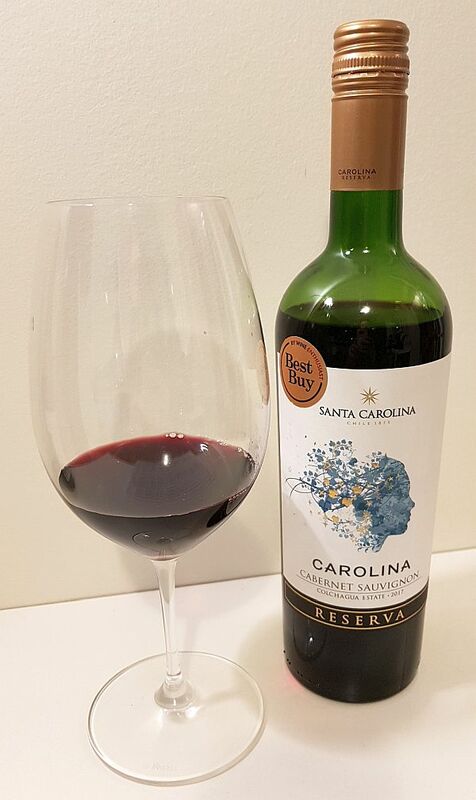 Santa Carolina Cabernet Sauvignon 2017, Chile ($13.99) – Deeper coloured, ruby and garnet. A little translucent at the rim, and 99% opaque at the core. The wine is dry, with medium body and flavour intensity, fine tannins, and some roundness. Primarily black currant flavour, with lesser amounts of ripe raspberries and plums, vanilla and oak. The wine has enough tannins to provide structure to this wine. It has medium plus length finishing dry, with mainly black currant flavour, and firmer, yet still fine tannins. Santa Carolina Cabernet Sauvignon 2017, Chile ($13.99) – With Decanting – Deeper coloured, ruby and garnet. A little translucent at the rim, and 99% opaque at the core. The wine is dry, with medium body and flavour intensity, fine tannins, and some roundness. Primarily juicy black currant flavour, with a hint of ripe raspberries and plums, vanilla and oak. There was also a more prominent floral perfumed flavour. The wine has enough tannins to provide structure to this wine. It has medium plus length finishing dry, with black currants floral, light raspberry and vanilla flavours, and firmer, yet still fine tannins. These wines are widely available through BC Liquor stores, and I see they are also on sale till Dec 29, 2018. Although the wine label does not affect the taste of the wine, various researchers have shown that a well-designed label can attract a person’s attention, which can lead to a purchase of the wine. I really think the Vina Santa Rita’s Reserve level labels are quite nice. I believe the label represents winery’s founder Luis Pereira’s wife, Carolina Iñiguez Vicuña and maybe her thoughts of their vines.